Heute bieten zwei der größten Ein-App-pro-Tag-kostenlos-Angebote freeappaday.com und freegameoftheday.com wieder zwei recht bekannte Spieler für einen Tag kostenlos an. Zum einen ist es das Spiel Pang Mobile von Player X, der auch das Planet 51 Racer im AppStore anbietet. Pang Mobile ist ein Klassiker aus den 80ern, der bei uns älteren Spielern sicherlich Erinnerungen wecken dürfte. A bubble blast from the past, Pang is the game you love and remember from the 80’s, even better today on the iPhone and iPod touch. 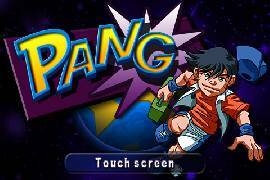 Test your reflexes in this hugely addictive official remake, „Pang“, also known as „Buster Bros“ in the US. Travel from Japan to the tropical shores of Hawaii as you take up the task of saving civilisation from dangerously bouncing bubbles that threaten city landmarks across the planet. Can you save Mount Fuji from being flattened by spherical dangers? Will your reactions be good enough to defend the Eiffel Tower or the Statue of Liberty? Or can you wear them down while saving your own skin? Everyone’s favourite from the arcades, Pang is easy to learn but difficult to master as you progress through 17 locations saving the world’s attractions with an assortment of weapons from the grappling hook to the twin harpoon. The game is crammed with power-ups including a force field and time freeze; anything to give you the edge over those deadly bubbles! Download Pang NOW! Relive the great times of retro gaming. Works only on iPhone / iPod touch 3.0 OS and above. 1.0.1– 2.2.1 OS and above support added. 1.0.2– OpenFeint online leaderboards supported. Und bei freeappaday.com gibt es heute das Spiel Babel Rising von Bulkypix (Entwickler von Spielen wie Hysteria Project, BaDaBoo und Magnetic Sports Hockey). Dies ist ein actionreiches Puzzlespiel, bei dem du Gott spielen darfst und mit Naturgewalten die Menschen daran hindern sollst, Türme in den Himmel zu erbauen. „You have six devastating powers at your disposal, including the thunderbolt, the typhoon and earthquake! From the simplest to the most powerful, master them, use them one after the other and combine them to increase their impact. „Perform the “divine combo” successfully and sweep away the humans from the tower’s levels in one go. Hilarious animations, detailed graphics and a soundtrack worthy of the best Roman Empire movies in a humorous setting. Search for God and you will find him! You are the boss and mankind will be sure to remember! Wer eines dieser oder beide Spiele haben möchte, der sollte sich diese unbedingt heute im AppStore herunterladen, da es diese beiden Spiele heute komplett kostenlos gibt.